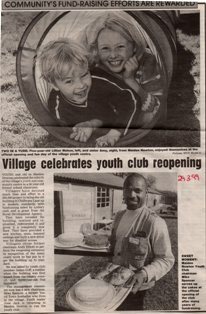 Young and old in Maiden Newton celebrated the rebirth of the village’s youth and community centre in a 50-year-old former school classroom. Villagers have devoted much time and effort to £63,000 project to bring the old building in Chilfrome Lane up to modern standards with fundraising aided by Lottery cash and a grant from the Rural Development Agency. They have reroofed the building, rewired and replumbed, redecorated it and given it a completely new floor. They have provided a new kitchen, store, lowered ceilings and built a new drive-way for disabled access. Villagers chose former chairman Andy Elliot to perform the reopening ceremony in recognition of the many years’ work he has put in to get the building up to standard. He was aided by the youth club member James Goff, a toddler when the building was first leased from the county council, and three-year-old Tod Hansford. The management committee now has a new chairman, Mike Spencer, a former Yeovil Town footballer who lives in the village. Youth leader June Jack is returning to Maiden Newton to run the youth club.